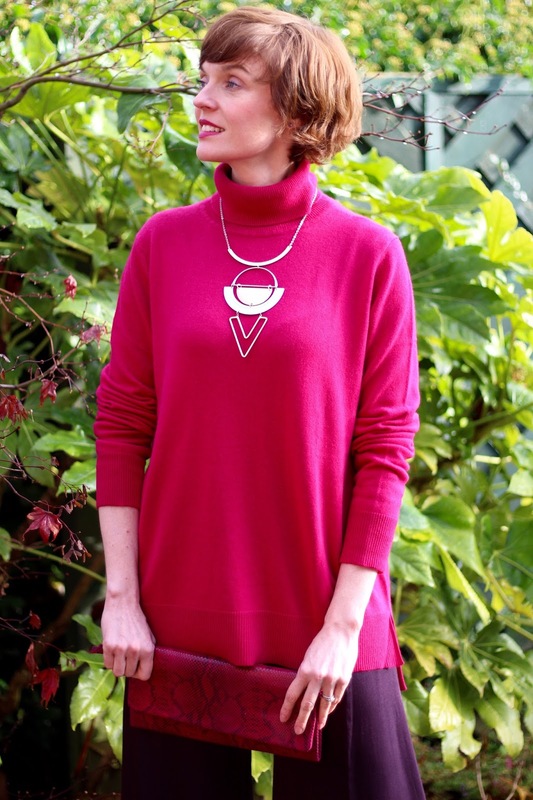 What could be easier to wear, cosier and more luxurious (on a cold day) than a cashmere jumper? 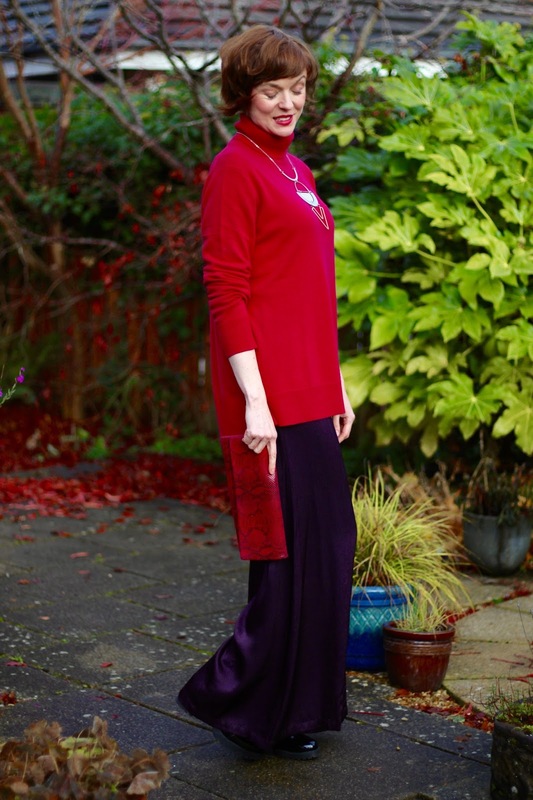 Cashmere is one of those fabrics that I could happily wear from head to toe. Warm, comfortable and not in the least bit scratchy. I have a few cashmere pieces, and always feel a little more sophisticated when I wear them. Being wrapped in a little bit of luxury is a wonderful thing! 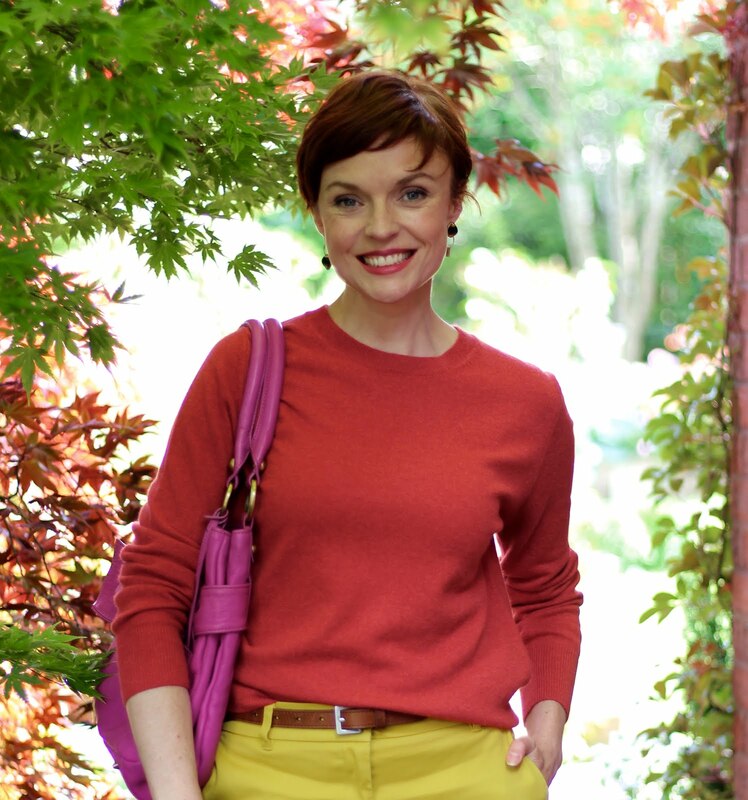 This cashmere jumper was sent to be by the lovely people at Woolovers. 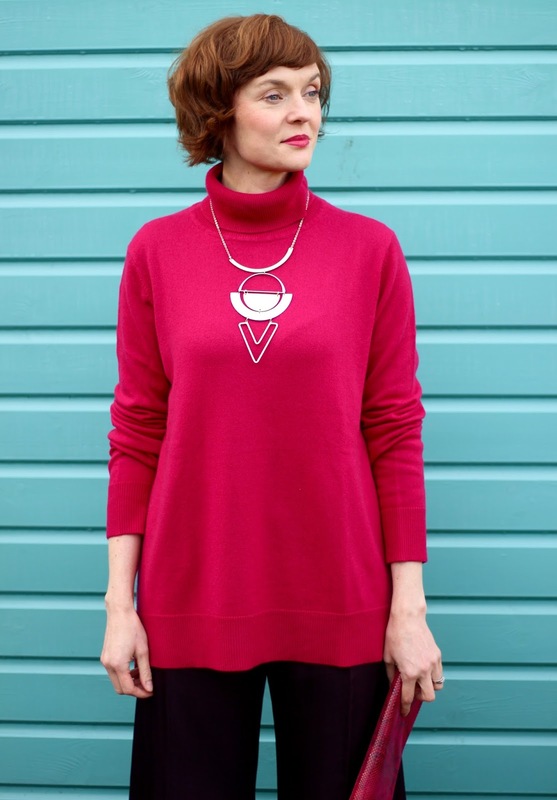 I was expecting a muted dark pink, so imagine my delight when the jumper arrived...and it is a bold and delicious magenta. Right up my colour street. Pink is one of those colours I used to dislike, but find myself drawn to it more and more as I get older. A rich pink, like this one, is such a happy colour. It is feminine, but bold, and casts a warm glow on your skin. The first thing that popped into my head was to wear it with purple! A rich and luxurious pair of purple satin trousers to be exact. Unfortunately, they are super-duper wide legged...and we all know the rules on baggy tops and wide legged trousers don't we? Wide trousers? Add a slim fitting top. Baggy jumper? Add a slim fitting trousers. Well, I don't care much for rules, so today I decided to break this one. 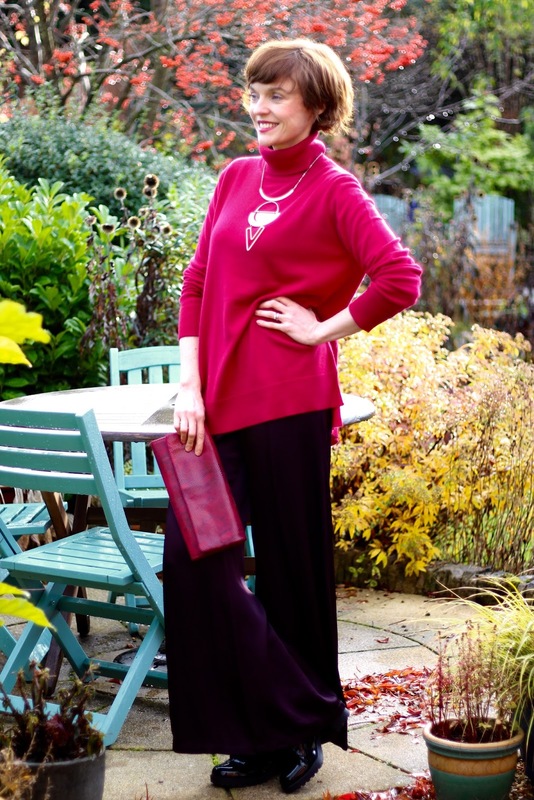 This jumper was calling out for some aubergine satin. So, these swooshy trousers were the perfect partner. 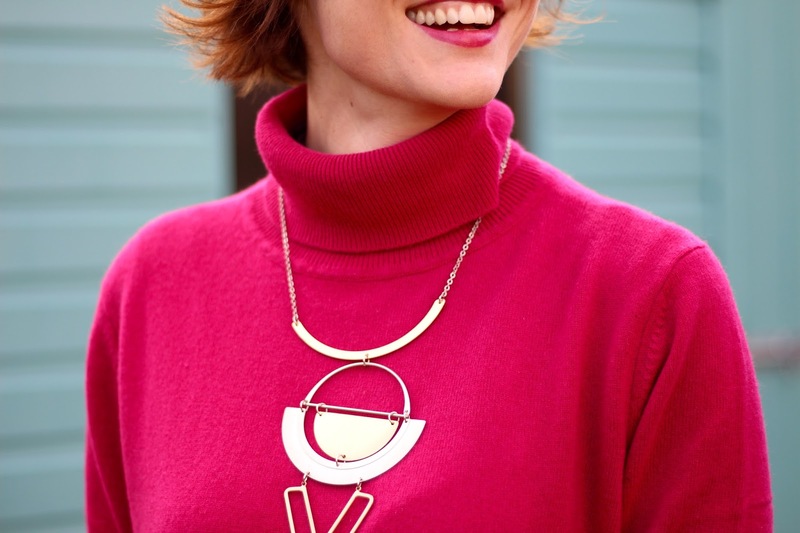 Adding a geometric necklace, bright lipstick and chunky boots finished things off nicely. Magenta and aubergine look mouthwateringly delicious together. Wool and satin make for a winning combination too. So this outfit had me grinning from ear to ear all day! BAG: TkMax... this is beautiful. Or, it is just too sweet for you? What about the rules of proportion? Do you stick to them, knowing they work? Or, do you throw the rule book out of the window? 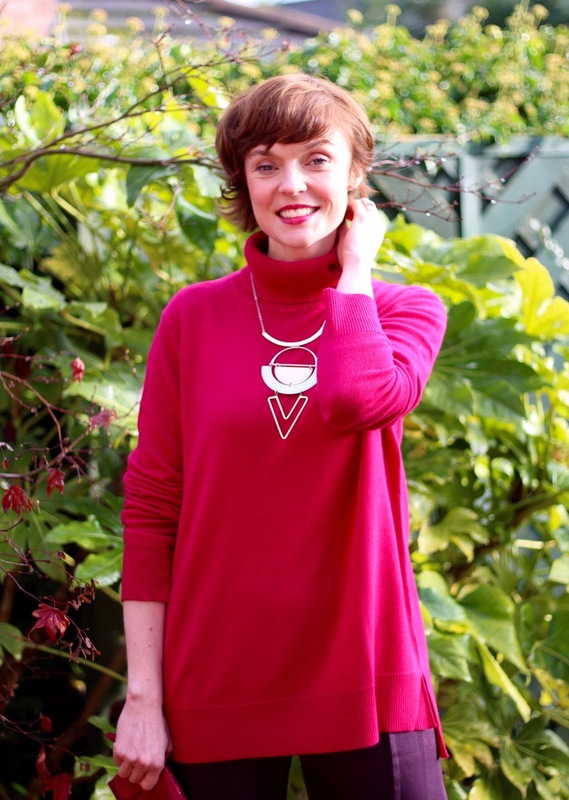 Linking up to: I will wear what I like (Monday), Visible Monday, Turning heads Tuesday. As you pointed out pink is WONDERFUL for the complexion. I think it brings out the pinky in ALL skin tones! You look so, so, so, pretty in this and the geometric necklace/pendant is a real stunner. Who cares about the rules when the colors compliment each other so well. Did you consider belting the sweater with something exotic, geometric, or funky? I'd do a belt and not the necklace if I wanted to take away the too flowy (frumpy?) look that breaks that rule. Love love pink, and pink cashmere is a win win. You look great in the combo. I would wear narrow trousers or belt the jumper because I have broad shoulders and need to wear form fitting styles, otherwise look like a fridge. You look gorgeous, and I like particularly the beautiful color combo and those rich textures! Proportions are not always the most important thing, sometimes it's better to wear something theorically "unflattering" and enjoy it and look fabulous, as you did! I agree re pink. As a fellow natural redhead, I used to hate pink in a younger life (especially the tone linked with a particular generously chested doll! ), but as I get older I am too drawn to fuschia, raspberry, magenta, the deeper or louder the tone the better! It has been quite a shock for myself and the family. I find it looks stunning with all beautiful jewel colours of purple, teal or turquoise. You look AMAZING!. I adore pink on redheads. Pink and purple. Those trousers are amazing with this! Your old mate Vicky here. Just want to say how very proud I am of you. As beautiful as you have always been from the first moment I met you and as classy as a lady can ever be. 90's Grunge in 2016 | The Fab 40's go all grungy! Vintage Pencil Skirt and a Purple Peplum. Lurex Co-ords and Black Knee Boots, over 40. Feeling Low? It's time for Comfort and Cobalt! Tartan Reefer Jacket and a Houndstooth Cap. The Problem with Wrap Dresses.